Description: To a fast-buck carnival man like Raymond I. (Pappy) Smith, it was like the ring of a silver dollar when Nevada legalized gambling back in the 1930s. He didn’t know much about casino games, but he figured he couldn’t go wrong by sending his sons to Reno to set up shop with a couple of nickel slot machines and a penny roulette game. Even in the midst of the Great Depression, the pioneer venture in a small room fronting North Virginia Street showed promise. Pappy promoted “The Biggest Little City in the World” far and wide. 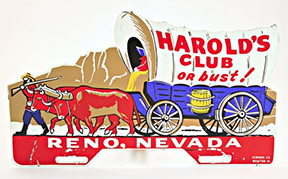 “Harolds Club or Bust” signs featuring the outline of a Conestoga wagon soon appeared in remote corners of the world. Business became so good that he built a seven-story tower billed as the “World’s Largest Casino.” The place had a Western theme, and employees dressed in Western garb to complete the effect. The biggest slot machine pay-out was a jackpot on which the reels showed pictures of the Smiths. The casino’s off-the-wall promotions included “mouse roulette,’ in which the winner would be decided by a mouse crawling out of a hole and resting on a certain number. It was 50 years ago this March that Harold Smith Sr. and Raymond I. Smith opened Harolds Club, Nevada’s oldest casino. Bio: Neal Cobb was born in Reno in 1939. As an adult worked in the family business Modern Photo. Worked at KNEV-FM 95.5, Dec 25 1953 – 1980 which was Nevada’s first “Successful” FM station. 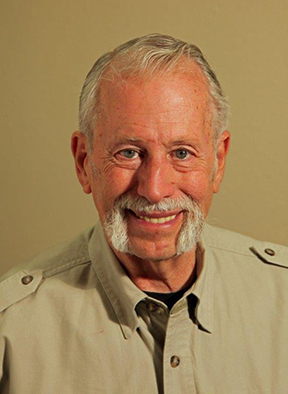 Neal served four years with the U.S. Navy as Radioman, later as a craps dealer at Harolds Club, eight years on Board of Adjustment Washoe County, eight years Washoe County Planning Commission, eleven years City of Reno Historical Resources Commission, and recognized author of two books “Reno Now and Then”, books 1 and II, and as an integral part of the Nevada Historical Society since 1988.